The star-crossed filming of Transformers 3 suffered another accident today when Bumblebee drove through an intersection and sideswiped a Washington D.C. Police SUV. 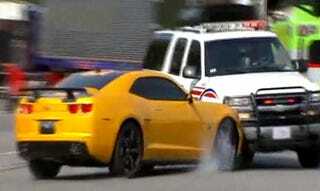 The crash was not part of the script and the yellow Camaro was seriously damaged. Several streets around downtown D.C. were closed off for filming; why the D.C. police SUV with sirens blaring decided to use the closed street isn't clear. The video from local TV station Fox5 shows crew members covering Bumblebee up after the accident. Another spectator near the scene showed how the filming began, with the Optimus Prime semi leading a number of vehicles down the street at high speed before Bumblebee was set to join them. It's not clear who is at fault, but it's yet another example of an accident on one of Michael Bay's action-charged sets.